A. Now just a second. I want to clarify all of this, how all of this fraud and stuff took place, if I can. My view is, when I forged a document and sold it, were that I was not cheating that person that I was selling it to because the document would never be detected as being a fraud. Obviously, if I would have known they would some day be detected, I wouldn't have done it. Q. Are you saying they could probably get as much as you were getting and you didn't feel badly? A. I didn't feel like I was cheating them. I'm tell[ing] you how I rationalized it. Also, when I took money such as from Rust or Pinock, it wasn't with the intention to never pay it back. It was always my intention that I would make good on it. My idea, at this time, was that I would be able to making [sic] good on it through the Oath of a Freeman. In fact, in your closing arguments in the preliminary hearing, one of the last things you said hit it right on the nail, and that is that a conman perpetually procrastinates. Or in other words, his intention, or at least my intention, wasn't to defraud them of their money. It was more to use their money when I needed it and then pay them back with interest to make it worth their while, which is something that for years has taken place in my transactions with Al Rust, for example. Of course, those aren't charge related. Q. Were you ever to the point, and I get this from a story in your early childhood, and I don't know if it is true or not, about you and the coin and you change the dates and you send it back supposedly it comes back as an authentic coin? Q. Is that real or a Hofmann rumor? A. This is a true incident. MR. STOTT: That's what I wanted to ask you. Is that the same kind of rationalization you used on these documents? A. Yes. I never would have done them, obviously, if I thought they could be detected. I thought I was clever enough to avoid that, which obviously I wasn't. Q. If the expert says they're a real document then the people who bought them really aren't hurt? A. Yes, that's right. And that's also when I lost respect for forensic examination, I guess. A. In my youth when I saw that, when I made up a process by which I could fool the Treasury Department. On page 177 of his confession, Mark Hofmann made this comment in reference to making notary seals: "I had that perfected before I went on my mission. I had reproduced notary seals before." On page 134, Mr. Hofmann claimed that he came up with his forgeries "when I needed the money. Like I say, this was money oriented." A. Well, previous to this I had lost faith in the Mormon Church. Q. Do you want to tell us when or was it a gradual thing? Q. Let's back off that a minute and get back to the documents. Was there any concern on your hand that... these people who perhaps had given you money were now investing sentiment and emotion and belief in these documents but it was based on a false premise. Did that enter your mind? Did that cause you any concern? A. No, that didn't cause concern in my mind as far as my feelings were it's not so much what is genuine and what isn't as what people believe is genuine. My example would be the Mormon Church, which may be a bad example since I'm sure you're both believers in it. I don't believe in the religion as far as that Joseph Smith had the first vision or received the plates from the Angel Moroni or whatever. It doesn't detract from the social good that the Mormon Church can do. To me it is unimportant if Joseph Smith had that vision or not as long as people believe it. The important thing is that people believe it. On pages 6-7, Mark Hofmann told of buying two "anti-Mormon" books while serving on his mission in England. Although Mr. Hofmann came back from his mission and married in the Mormon temple he seems to have had absolutely no faith in the church's claims. "Court documents indicate that some prosecutors in the Salt Lake County Attorney's office believe Mr. Hofmann's goal was not only to obtain money from the church through the sale of the documents but also to establish enough credibility that he could shape the world's perception of Mormonism. "This view is shared by a man here who was the first to suggest that Mr. Hofmann was forging his documents. He is Jerald Tanner, a former Mormon who heads the Utah Lighthouse Ministry, which for decades has been challenging the truth of much of Mormon doctrine. "Mr. Tanner said it appeared that Mr. Hofmann's growing credibility as a source of documents was putting him in a position where the documents he presented were considered unassailable. If that continued, Mr. Tanner said, Mr. Hofmann 'could control the direction of Mormon history.' "
A. ... a lot of people, just from what I read in the paper or whatever about me. The idea is that free money wasn't the primary consideration, it was more changing the history of the Church or rewriting the history of the Church, how I thought it should be or whatever, which really wasn't ever the primary consideration. It is true that I wrote the documents according to how I felt the actual events took place. In other words, I believe that Joseph Smith was involved with folk magic, but the idea there was more to keep it in harmony with what I thought potentially genuine, discoverable type documents may say. In other words, to make it fit the history as accurately as possible so that I wouldn't be found out or whatever. In his youth Mark Hofmann would have been taught that the Mormon Church leaders were led by revelation and had the gift of discernment to detect deceivers. The prophet Joseph Smith, in fact, claimed that he received a revelation from God Himself warning him that his enemies were falsifying an important religious document (see Doctrine and Covenants, Section 10). Hofmann, however, seems to have finally come to the conclusion that the Mormon Church was not led by revelation and that he could even deceive the "living prophets" and the top Mormon scholars as easily as he did the U.S. Treasury. On page 99 of his confession, Mr. Hofmann said that he could "look someone in the eye and lie" and didn't believe that "someone could be inspired" in a religious sense as to what "my feelings or thoughts were." On page 112 he claimed that he "wasn't fearful of the Church inspiration detecting the forgery." MR. STOTT: Let's go to the Anthon Transcript. Can you tell us when it was and how it was that you came up with this idea? A. I can tell you when it was. It was just days before the discovery was announced. How it was in some book, probably B. H. Roberts. I read a description of the transcript which Charles Anthon gave which does not match obviously the known character page, which the RLDS Church has, and I found that to be a pretty neat discovery. Q. What was your thinking from there? A. Well, I probably can't be lucky enough to find it so why can't I make it. Q. Did you have enough confidence in yourself at that time to think you could make that big of a document, that important of one? A. I thought that from what reading I had done as far as document authentication, that using the proper ink and oxidizing it the same way time would, that it could be pulled off. Q. You're talking about after you applied the ink? A. Yes. In fact, I can tell you it was heated before it was dried because of the nature of theYes, this would have been after the ink because I was aging it. You can see how the paper around this dark spot in the bottom half kind of wrinkled as it was being ironed. That would be evidence the paper was not dry when it was ironed. Q. Why did you do both the hydrogen peroxide and the heat? A. Well, I was trying to make it look old. The hydrogen peroxide made the ink look old. The heat made the paper look old. Q. But the paper was already old. A. Yes, but it made it look like it had seen some use. It was ragged, it was well aged. It is true that it was genuine paper from that period but I thought it would be more convincing rather than being pure white to show that it had the high acid content and the problem I thought was also I wanted it to have high acid content so it would stain the page in the Bible. MR. STOTT: ...We are talking, of course, about the Cambridge Bible. Can you tell us, Mark, where you first saw this, when it was and under what circumstances? A. Yes, I acquired it in Bristol, England on my mission. It's dated 1668. Q. Can you tell us any other things that you did to the Bible as far as additions, deletions, changes? A. I believe there's only one other thing I did and that is in rather the middle of the Bible there's some handwriting of the Book of Amos which is handwritten and bound in. Q. Now, was the writing on the insert, was the writing there? Q. The Book of Amos? A. Except for the name Samuel Smith at the conclusion of that writing. Q. Was there anything before you put Samuel Smith there? A. Yes, I believe that I may have made a previous attempt. There was nothing there, no, before I got it. 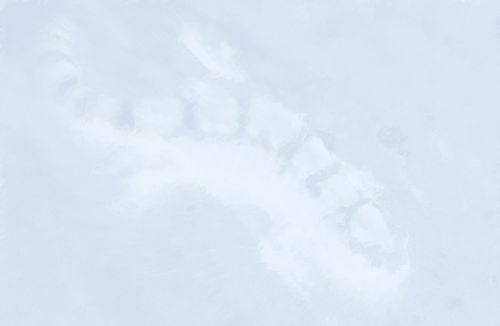 I think I may have attempted to write a name there that I wasn't satisfied with so I bleached it out and wrote in another one. Q. Do you remember what you used? A. Under ultraviolet light would indicate that. The other name would have also been Samuel Smith. Q. When you say bleached, just common bleach? Anything special? A. It was probably a combination of a dilute Clorox bleach followed by a solution of sodium bicarbonate, followed by hydrogen peroxide. "If the document had been in intimate contact with the pages of this Bible over a prolonged period of time, I would have expected the characters themselves which were made of the iron gallotannic ink to transfer onto the pages themselves. The highly acidic ink would have burned the pages in the form of the letters themselves  the characters which comprise the ink. In fact that did not happen. There is a uniform browning across the page rather than the ink itself, the characters of the ink, burning the pages in the shapes of the... letters and the characters on the page." Q. Anything else we should know about that? A. Well, yes. I can tell you about the Book of Proverbs where the page was added. I believe I folded the transcript up. I knew about the width of it when I placed it in there. When it laid down. I then used a piece of aluminum foil which I folded to be about approximately the right size, several layers, put it on there and heated it up with an iron, placed on it to make it look like the acid from the paper had browned the leaves of the Bible. Q. Will you describe a little more. You've got the aluminum foil next to the paper? A. The aluminum foil placed on it. A. In other words, it's a piece of metal the right size placed on the book, heated with an iron. Q. We are not talking about the Anthon Transcript itself, we are talking about just aluminum on the page of the Bible? Q. That's how you made it brown? Q. And you heated it up with what? A. Probably had another piece of foil on the back of it so it wouldn't bleed through as much is [sic] it did on some of those other pages, and then I heated up with the iron, the family iron like you iron clothes with. Q. And that's what made the brown mark? A. That's what made the brown mark. A. I glued it in.... You will probably want to know what the glue was. MR. YENGICH: I'm sure they shall. Why don't you tell them? A. It was some charcoal ground up with a wheat paste which I found was not terribly sticky, and so, believe it or not, I added a couple drops of Elmer's Glue to it. MR. YENGICH: With the little orange cap on it? A. Yes, just regular Elmer's Glue. MR. YENGICH: That a student might use? A. You don't have a spectroscopic report on that glue, I presume? Q. Where did you get the idea for this charcoal and wheat paste? A. I thought to myself, I need to glue this in here, what looks like old glue.... I was in a hurry, I wanted to get this thing done that day. A. I don't know. It's just, I'm always rather impatient.... what I did was I lit a book match, let it burn down, broke off the tip of it and ground up the match. That was my charcoal and mortar and pestle. Scraped it off on a piece of paper where I added some salt and flour paste. MR. STOTT: Just salt and flour basically was the paste? A. Yes. I believe it was wholewheat flour with salt and water. I mixed it around with, probably used a toothpick or something, found that it wasn't particularly sticky and added a couple drops of glue to it, of Elmer's Glue. I then folded the document up. That is, of course after it was all aged like I liked it and everything. A. I hoped the Church would carry on some tests because I felt confident it would pass. In fact, that was part of the arrangement I had with them when I left the document in their possession before actually selling it to them. As far as I know, all they did was to deacidify it and, actually I'm not even sure. I think they said they had deacidified it and I know they mended the creased tear. Q. Anything about their taking infrared photographs? A. Yes, I knew that also. Don Schmidt took the document to BYU, I believe is where they had the photolab or whatever, took ultraviolet and infrared photographs of it which, I guess can be somewhat related to authenticating it. Q. You were disappointed in the meager attempts they made? A. I thought they would put it through more strenuous testing than they did. As far as being disappointed, I don't know. Well, perhaps in a way I was disappointed because I wanted, in a way, to fool the experts. As it turned out, neither the "living prophets" nor the church's most noted scholars were able to detect the diabolical scheme. 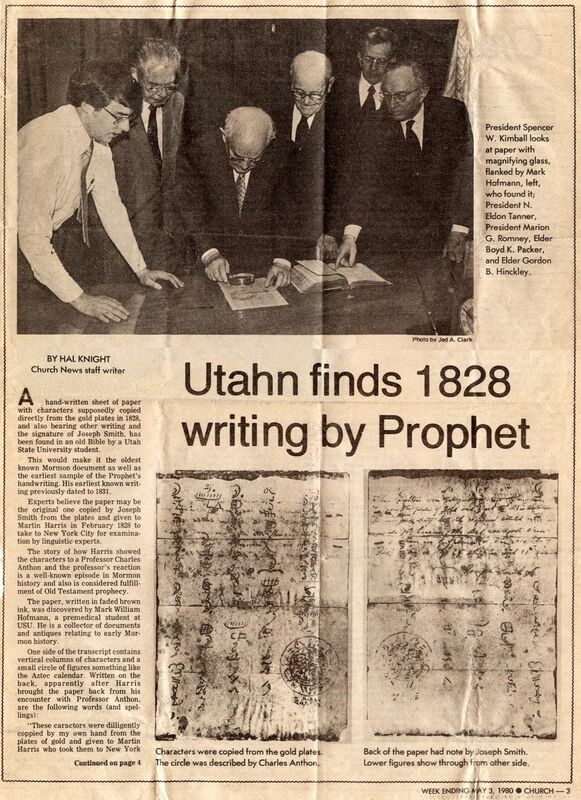 In fact, Mr. Hofmann was honored for making the "discovery," and the church's Deseret News, May 3, 1980, printed a photograph of Hofmann standing with Spencer W. Kimball, the twelfth Prophet, Seer and Revelator of the church. Also present were President N. Eldon Tanner, President Marion G. Romney, Apostle Boyd K. Packer and Apostle Gordon B. Hinckley. Neither President Kimball nor any of the other General Authorities were able to detect anything wrong with either "Brother Hofmann" or the Anthon transcript. President Kimball, in fact, is shown making an examination of the transcript with a magnifying glass. In his confession, page 112, Hofmann said that he had "a combination of emotions. There was, of course, a little bit of fear involved since, of course, it was a forged document. There was some excitement involved, a feeling of duping them, I guess." The Church's most noted apologist, Dr. Hugh Nibley, examined the transcript and claimed that it contained Egyptian characters. He, in fact, triumphantly announced: "Of course it's translatable." (The Herald, Provo, Utah, May 1, 1980) According to the testimony of Church Archivist Donald Schmidt, the church gave Mr. Hofmann $20,000 worth of trade items for the transcript. After the Anthon incident, Mark Hofmann deceived church officials time after time with his phony documents and stories. Just after the bombings, President Gordon B. Hinckley acknowledged that the church had acquired "40-some" documents which came from Hofmann. Later it was admitted that in addition to these documents, Hofmann had given the church about 345 court records. Most of these were "returned to the Circuit Court clerk in Hancock County, Ill." (Deseret News, April 12, 1986) There seems to have been a question as to whether these documents had been obtained illegally (see Salt Lake Tribune, April 12, 1986). Q. What was your purpose for giving it [the Thomas Bullock letter to Brigham Young] to the President? A. Probably the greatest purpose in my mind was to demonstrate to him my concern for the Church, or in other words, possibly, a potentially embarrassing document would not fall into hands that might use it against the Church. And to prepare him for future dealings as far as if my true interest and intent was for the welfare of the Church. Q. Was that something you were using to further your own purposes? Q. Purposes of continuing to deal in similar types of forged documents? The more we learn about the scope of Hofmann's subtle plan to deceive the Mormon leaders, the more obvious it becomes that the church is not led by revelation. He, in fact, had church officials so hoodwinked that they allowed him special access to documents that are ordinarily hard to get access to. As early as September 28,1982, the Seventh East Press reported that since the discovery of the Anthon transcript Hofmann has "enjoyed privileged access to otherwise restricted Church archive material, including the First Presidency's vault. One reason for this privileged access, Hofmann thinks, is the fact that 'I am not a historian. I'm not going to write an expose of Mormonism.' " In his confession Hofmann reveals how Earl Olsen granted him the privilege of looking at a document he seems to have used in writing the Joseph Smith III Blessing. Hofmann claims that Olsen "was saying about how I had done so much for the Church, referring to the Anthon Transcript, that ordinarily he wouldn't do it but he did (Hofmann's Confession, page 141) Mr. Hofmann also confirmed in his testimony that he even "saw some materials from the First Presidency's vault..." (Ibid., page 453) Hofmann seems to have used his special privileges with regard to church documents to create new forgeries to palm off on unsuspecting church leaders. It would be hard to conceive of a more pernicious scheme. A. Where did I obtain a [sic] that? A. From the Church Historian's Office. I remember there was a couple [of] articles in that that I fained interest in which I asked Don Schmidt to Xerox for me and went with him into the back room there where they have their Xerox machine and he copied it off for me and handed me the copies and those Xeroxes are what I used to compose the artwork with, taking the context of the ad from another printer's ad. A. Oh, yes. In fact, I remember that I did show it to President Hinkley and I obtained a check for it. A. 15 thousand, was it? At the preliminary hearing former Church Archivist Donald Schmidt was asked how much the Church paid for the Grandin contract. He replied: "I recall it [was] $25,000." Mr. Schmidt also testified that President Hinckley was involved "very early" in the negotiations for the Grandin contract and that he was "sure" that Hinckley personally examined the document (see chapter 6 of Tracking, under Grandin Contract). In chapter 5 of Tracking, under Documents Flaky, I pointed out that while document experts felt the ink had been artificially aged in Hofmann's documents, they believed that in most cases the paper was actually genuine paper of the period from which the documents were supposed to have come. On page 67, I suggested that Mr. Hofmann would have had access to many old collections from which he could have obtained the paper. As I have already shown, Hofmann has confessed that he cut out blank pages from books to obtain most of his paper. In his confession he mentions the publication Nile's National Register at the University of Utah as being a source for a number of the documents. In chapter 5 of Tracking, under Documents Flaky, I wrote the following "Before the bombings, one of Mark Hofmann's associates did his best to try to convince Sandra and I that it would be impossible to apply ink to ancient paper without the ink feathering in such a way that the forgery would be detected. Charles Hamilton speaks of this problem in his book Great Forgers and Famous Fakes, page 206: 'The feathering of ink is one of the most obvious marks of a modern fake on old chain-lined paper.' Mr. Hamilton informs us, however, that it is possible to size the old paper so that the modern ink would not feather." In his testimony, page 152, Mr. Hofmann revealed that he did treat the paper "to keep the ink from feathering. The sizing I assumed would have been a lacquer spray which would have been soaked off later by acetone. The laquer would have dissolved in the acetone." A. ...As far as the ink, I got the recipe from a book that I stole from Utah State University Library. I believe the book was called Making Ink, or some name like that. It was, it's a translation from a German edition. It's by some German guy. MR. STOTT: From the library or the bookstore? A. It's from the library. I removed the metal tag from the back of the spine so I could walk through their detectors with it and walked out of the library with it. Q. Tell us about that book. Did it have a whole bunch of recipes? Q. Did it give you the properties of ink? A. Didn't give you really the properties, gave different recipes for different inks as well as the iron gall ink. It gave recipes for, well, for example in the 19th Century there was a blue ink commonly used, made out of Persian blue that was made water soluble by soaking in oxalic acid. There was a recipe for early stamping inks, not printing inks, however. There were recipes for different types of colored ink, both before and after the coal tar inks. Q. More than one iron gall? On page 418, Mark Hofmann commented: "Most forgeries can be fairly easily detected from the ink. I'm one of the few forgers, I believe, at least up to that time, that used an iron gall." Even though Mr. Hofmann felt that he was safe in using iron gallotannic ink in his forgeries, it was the ink that eventually tripped him up. When the document experts were examining Mark Hofmann's documents and comparing them with authentic documents they noticed "a microscopic cracking on the surface of the ink." This cracking effect, which George Throckmorton describes as having the appearance of the "skin of an alligator," appeared only on Hofmann's documents. Forensic examiners wondered what caused the flaky looking ink on the these documents. William Flyn testified that he found that he could "artificially age" iron gallotannic ink with either "sodium hydroxide" or "ammonium hydroxide, dilute ammonium Hydroxide is household ammonia." He felt that sodium hydroxide was especially effective and that it "will immediately take the iron gallotannic inks and turn them a deep rust color on the paper. It won't crack the inks, however." In his testimony, Mark Hofmann acknowledged that he artificially aged the ink on his documents with either ammonia or hydrogen peroxide and that at one time he may have used "a combination of ammonia and hydrogen peroxide." (Hofmann's Confession, p. 292) He claimed that the hydrogen peroxide was just "a common 3% solution you buy at a store for medical purposes." At any rate, William Flyn was puzzled by the fact that the ink he made did not crack as it had in the Hofmann documents when he artificially aged it. He claims that it "was not until I began adding some of the additives that were typically added to the inks of that time period, in particular, the sugars and the gums" that he obtained the same results. He said that "gum arabic" was "commonly added to the ink to give it body, as a viscosity adjuster to adjust the thickness of the ink, and also as a preservative. It slowed down the oxidation of the ink on the paper. When I mixed the iron gallotannic inks and added either the sugars or the gum arabic and then artificially aged them with sodium hydroxide, I got exactly the same... phenomenon that I described in the examination of the questioned documents. The ink both artificially aged and cracked." A. ... You will be interested to know that I also, even before the preliminary hearing, spoke to Ron [his lawyer] about my fears as far as the cracking was concerned. Q. Oh, really? You had seen that cracking before yourself? A. Yes, although I didn't know the cause of it until the preliminary hearing as far as the gum arabic and undoubtedly when somebody reads this transcript they'll keep gum arabic out of the formula. A. Yes, there was other techniques in aging of the paper. I believe that there is a, what appears to be a bookworm's hole through the document. When it is folded it goes through two pages. Q. How did you accomplish that? A. That's a strange story. We had some bags of wheat down in our basement which were in a type of paper bags which we found little bugs had eaten through and I took, I thought that was interested [sic] so I took what looked like a little fly and put it in a notebook and came by a couple days later and it ate through a few pages. So I thought it was rather convincing, so I believe that that document has bookworm holes in it. MR. BIGGS: It was an interesting story. MR. YENGICH: Is that true? You did do that? It's not a story in the Grimms Fairytales I take it? MR. BIGGS: What document has bookworm holes in it? A. Tell me if you ever find a document with bookworm holes in it. I'll be interested to see. Its probably a printed document, as I remember. I believe it would have been a printed document. "As I have already stated, it could be argued that Hofmann himself was the 'master forger' and that he was totally responsible for all the forgeries. He certainly seems to have had the same formula for the ink during the period when he produced the Jim Bridger notes as he had earlier  the ink cracked in the same way as on the Salamander letter and the 1825 letter. It appears also that the documents were aged in the same way. One could probably argue that Hofmann just became lazy and no longer desired to exercise his calligraphic skills. At the present time, however, I find this explanation a little difficult to accept. It seems to me that the time and money he spent getting the Jack London inscription onto a metal plate and the work of actually printing it in the book would far exceed that required to just write the inscription with a pen. I must admit, of course, that anything is possible in this bizarre case, and I do not pretend to have all the answers. Perhaps the truth about this matter will come out when the case goes to trial." Q. The handwriting [on the back of the Anthon transcript], did you have to practice that much or were you already practiced with Joseph Smith's handwriting? A. It didn't take much practice, I don't think. In fact, the whole transcript was written, probably that section composed and written on both sides, the paper aged the way it is and the ink all in one day. As far as my previous experience with Joseph Smith, I had previously made attempts to imitate his handwriting. Q. 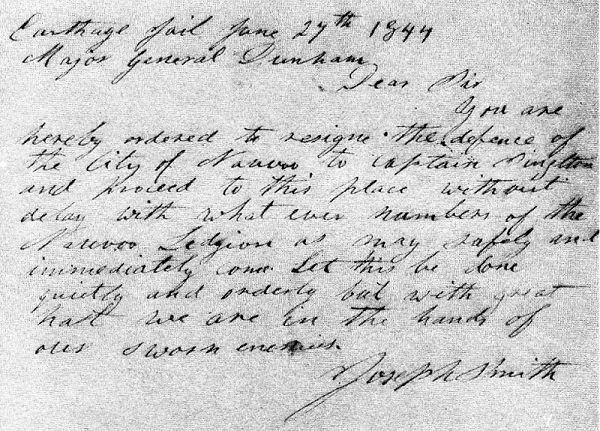 Besides Joseph Smith, had you, during this time or prior to it, copied other people's handwriting? A. To some limited extent, I have. Q. Did you take any classes during this time, any handwriting or calligraphy classes? Q. Is this skill in copying handwriting, is that something that you had to work at or is that something that came easy to you? Can you explain it? A. Although I really don't consider myself an artistic person, I think I have the ability to look at handwriting and copy it. I don't think it is any certain talent or other people, I think can do the same thing. Although I haven't conducted any surveys on the matter. Probably to some extent it is a talent only insofar as I have developed it through practice, but I wouldn't say that I was born or had a natural talent for copying handwriting. A. ...I knew that it [the Dunham letter] is an important document and is bound to be looked at. I felt like it would fool the experts in the Church, specifically Dean Jesse. My best forgery attempts are obviously in national-type material rather than church material, for that reason. MR. HOFMANN:...Let's see, we also spoke of a calligraphy class I was involved in with my wife. That didn't have anything to do with these forgeries. I took it just because my wife was taking it and didn't learn any 19th Century handwriting or anything useful to these forgery skills. In fact, it took place, or I took the class after most of these forgeries we're talking about, I had already done. MR. STOTT: Can I ask a question concerning that? Q. Even though you have something else to say. Almost everything that we've found, and almost without exception, most people felt that you could not duplicate other peoples' handwriting because all they ever saw of you was your printing, which was in a very sloppy hand. Was this part of your deception? A. No, because I had that handwriting even before I decided to go into forgery. That was just my normal handwriting. Q. Did you develop the skill of replicating other peoples' handwriting or was it natural or what? A. ... Shall I draw you a diagram? Q. Yes, and Mr. Rich can keep it since they've been keeping everything else. 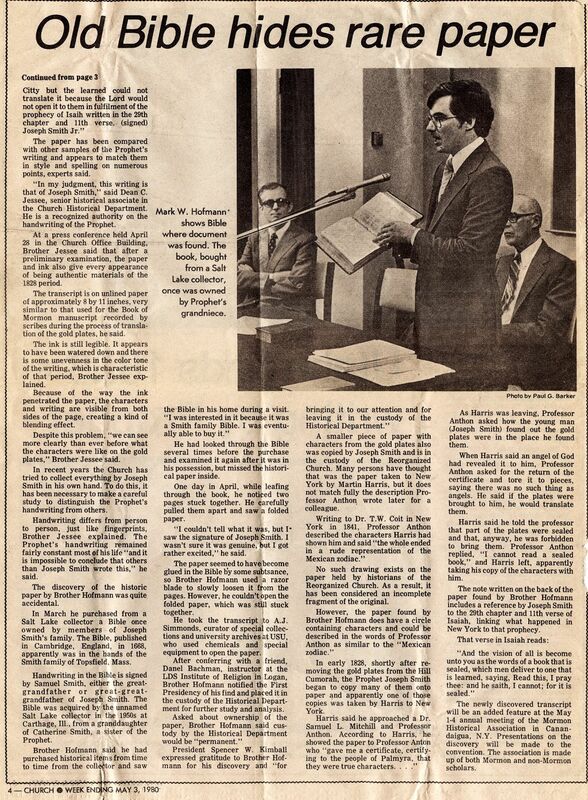 "When we talked to Hofmann on August 24, 1985, he brought up the subject of Mr. Boren. He said that he felt that he should tell us that he had known of Boren before we published Mr. Boren and the White Salamander. He did not say that he knew him personally, but only that he had been called in to look at some forged Butch Cassidy material. When I asked him if it was a good forgery, he replied that it was a very poor job. It is interesting to note that a photograph of a portion of an important letter Boren discovered relating to Butch Cassidy was published in the Westerner, May-June 1973. One thing that is a little suspicious about the letter is that Boren chose to suppress the names of both the writer and the recipient (see pages 41 and 62)." Brent Ashworth has added some interesting information with regard to the forged Cassidy material Hofmann had told me about. He claims that Hofmann himself sold him the Butch Cassidy material. It was actually photographs of Butch Cassidy and his friends which were signed by Matt Warner. Mr. Ashworth subsequently learned that the photographs were forgeries and confronted Mark Hofmann about the matter. Hofmann claimed that he had obtained these forgeries from another man who lived in Salt Lake City and agreed to give Ashworth his money back. Although Hofmann did not link Boren to the pictures in the conversation with Ashworth, he did tell him that Boren was making up Mormon documents and that they must be on guard against his spurious work. Kerry Ross Boren seems to have had a real interest in pictures of both Butch Cassidy and Matt Warner (see photographs in Footprints in the WildernessA History of the Lost Rhoades Mines, and Newsletter of the National Association and Center for Outlaw and Lawman History, vol. 1 no. 1). MR. STOTT: You intimated one of them was a forgery. Do you want to tell us which one? A. One of them may have been a forgery. Q. Do you want to tell us which ones they may have been? A. No. Probably not at this time. I didn't say I forged it. I mean, I've handled documents before that were forged that I did not forge. Q. But you passed along? Q. Without telling someone they were forged? A. Not in the Mormon field. But this one was big. Even though there are many strange parallels between Boren and Hofmann, I have still not found any real evidence linking them together, and the fact that some of Boren's material and ideas have remarkable parallels to the Hofmann documents might only indicate that Boren was copying Hofmann's ideas. Ironically, both Hofmann and Boren were charged with murder, entered into plea bargain agreements and ended up at the Utah State Prison. Q. Called the, Statutes at Large Passed in Parliament in Ireland dated in the area of 1786. The reason I show you this is there are many areas throughout the book where letters and words have been carved out from the typing. Did you ever do that? A. I remember the book because of the end sheet paper but I do not remember, I cannot imagine why I would have done that. For a couple of reasons. I did not actually cut out of books. I cut out of Xeroxes which I made of books and I can't think of the any [sic] item I would have cut those out to use it for. MR. RICH: That means there is another forger out there. A. I don't believe I did that. A. The printing ink. Made with lamp black, linseed oil that was heavily boiled, bees wax and that's all, probably. Q. What did you do after you prepared the printers ink? A. I rolled it on the plates and put the paper on top and packed it with several other sheets of paper or heavy paper. Put another piece of metal on top and used a C-clamp to apply the pressure. Q. And none of these Deseret Currency sets where [were?] done with a printing press? A. That's correct. I could easily show you how they were done if I had those simple materials that I described. Namely a fairly thick piece of sheetmetal, copper, the plates, paper and some sort of backing of either a thin cardboard or paper. A. The plates were on the top shelf in the closet of my downstairs office until I destroyed them after returning home from the hospital after the bombings. Q. How did you destroy them? A. They were burned in my fireplace. The metal burns a bright white, incidentally, but I knew that it was flammable, the wood backing and also the metal and that was their fate. Q. Did anybody in your family know you did that? A. They knew I had a fire but not I was burning plates in that fire. Q. Was this when you were still in the wheelchair? A. Yes and no. I was able to jump around somewhat on one leg before I really went on crutches. But it was in that time period where I would have been out of my wheelchair, when I went downstairs.... I went in the room, in my office and whatever incriminating evidence that wasn't already taken I put in a bag and probably that same night is when I built a fire. Q. That was my next question. Was there anything other than the plates that you destroyed that night in the fire? At the end of chapter 6 in Tracking, I stated: "Besides the many questionable documents I have mentioned in this chapter, detectives are looking into printed forgeries of old books. Investigators have apparently found a forged copy of The Latter-Day Saints' Emigrants' Guide, by William Clayton. 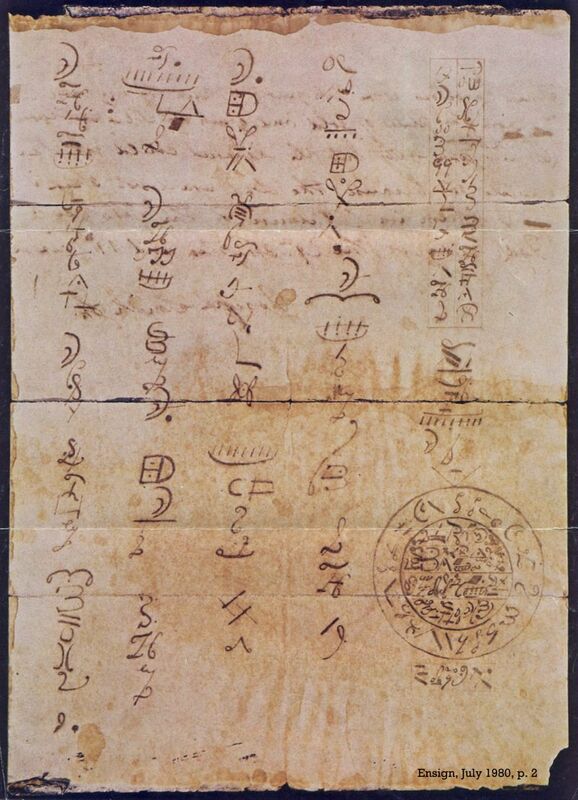 In most cases it would not be worth the expense and time to reprint rare books on old paper. With the Emigrants' Guide, however, we have an entirely different situation. It has only 24 pages and is worth thousands of dollars. Any small item which has a high monetary value would be worth counterfeiting with printing plates." Q. That would have been the Kansas City would have been the Immigrants' Guide, would it not? Investigators have charged that Hofmann forged pages to replace pages that were missing in old books. In the case of the "Emma Smith Hymnal," the addition of one forged page increased the value by thousands of dollars (see Tracking, Emma Smith Hymnal). In his testimony, page 229, Mark Hofmann admitted he had tipped in  i. e., added in by pasting  "possibly hundreds" of pages into books: "...what I am describing is my usual technique in typing [tipping] pages in.... I've done it a lot... I don't remember specifically doing this work as opposed to the dozens or possibly hundreds of other pages that I've typed [sic] in." It could be that some of the pages Hofmann added in were genuine pages from other old books, but since we know that he did printing forgeries on old paper, every book that he worked on should be looked at with suspicion. While Mr. Hofmann's printed forgeries could cause a great monetary loss to those who obtained them, they do not really affect our understanding of Mormon history. It is obvious that they would have to be exact reproductions of original editions. If the contents varied in any way, it would give the whole scheme away. MR. STOTT: Were you aware of the LDS Church subjecting any of these to any scientific evaluation other than the Anthon Transcript? A. Meaning a forensic examination? A. Not that I can remember. And even the Anthon Transcript, I believe they ended up not doing anything, or much on. Q. Were you surprised at that? A. At first I was. Particularly with the Anthon Transcript but then I got used to them not doing it and even if they would have done it my feeling was it would have passed a forensic test. In other words, I believe the blue ink I would have used for the lines would have been a Persian blue similar to what was used in the 19th Century. The ink, I thought would pass, the paper, the handwriting. Of course, handwriting examination is always subjective but I thought that it would pass. Q. How about the other dealers you dealt with? Were you surprised none of them basically had these documents forensically examined? A. Autograph dealers rarely do. In fact, I can think of documents that have sold for 10s of thousands of dollars that haven't been examined by autograph dealers as far as forensic tests.... Forgeries are often detected by the handwriting on the document. That I knew would be closely examined. I took great pains to imitate the handwriting. I'm speaking now of national type documents that, for example,  Well I won't use any examples because you will have to wait until Ron is here. A. No. I had used Charles Hamilton before in authenticating documents. Q. On any of the ones we've talked about? MR. BIGGS: On documents that you've produced is what you're saying? A. I don't believe I've even talked about what I did to age the Joseph Smith, 3rd document. Only the Anthon Transcript. MR. BIGGS: All right. Anything else? A. Yes, but you want this off the record. MR. BIGGS: Off the record. MR. RICH: We've just had an off the record discussion about the detailed techniques of forgery that probably would serve no public benefit and would allow potential forgers significant resources toward their trade. A. And if I write a book you will learn a lot more.